You are browsing the Blog for jonny cruz. 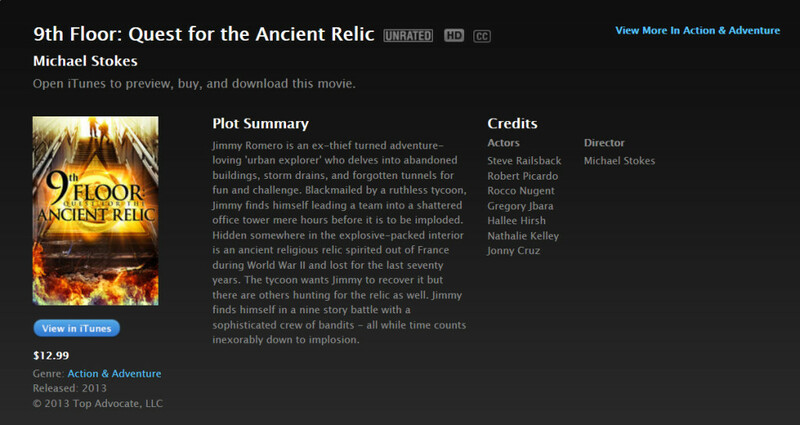 9th Floor: Quest For The Ancient Relic is now available to purchase and download on iTunes! Written and Directed by Michael Stokes, 9th Floor: Quest For The Ancient Relic is about Jimmy Romero, an ex-thief turned adventure-loving ‘urban explorer’ who delves into abandoned buildings, storm drains, and forgotten tunnels for fun and challenge. Blackmailed by a ruthless tycoon, Jimmy finds himself leading a team into a shattered office tower mere hours before it is to be imploded. Hidden somewhere in the explosive-packed interior is an ancient religious relic spirited out of France during World War II and lost for the last seventy years. The tycoon wants Jimmy to recover it but there are others hunting for the relic as well. Jimmy finds himself in a nine story battle with a sophisticated crew of bandits – all while time counts inexorably down to implosion. The cast includes Jonny Cruz, Nathalie Kelley, Hallee Hirsh, Robert Picardo, Gregory Jbara, Rocco Nugent, and Steve Railsback.